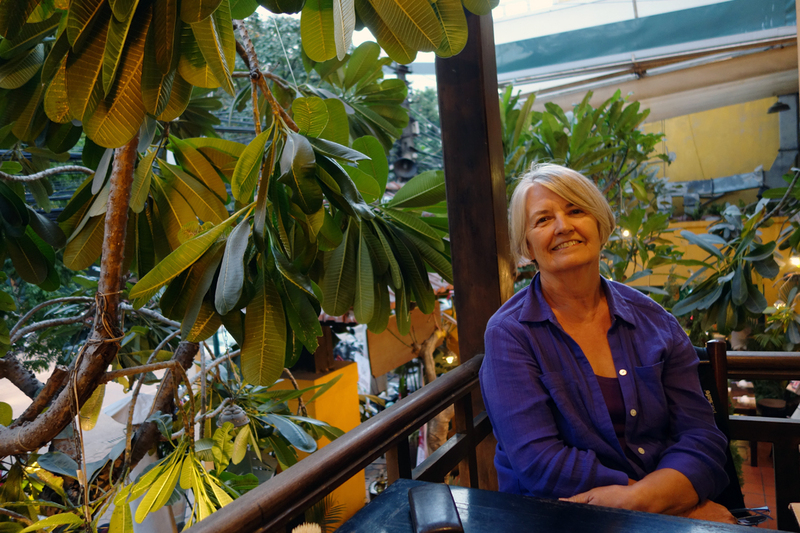 It was raining early this morning, so it was a ‘good’ time to leave beautiful Hoi An. Our flight to Hanoi was a short one: about an hour. There was sunshine in northern Vietnam, but it was definitley a bit cooler than what we had experienced on the central coast. The locals were all bundled up in their winter coats, and looking at us a little bit funny as we strolled about in short-sleeved shirts! Still, it looks like we may even have to wear a jacket up here. 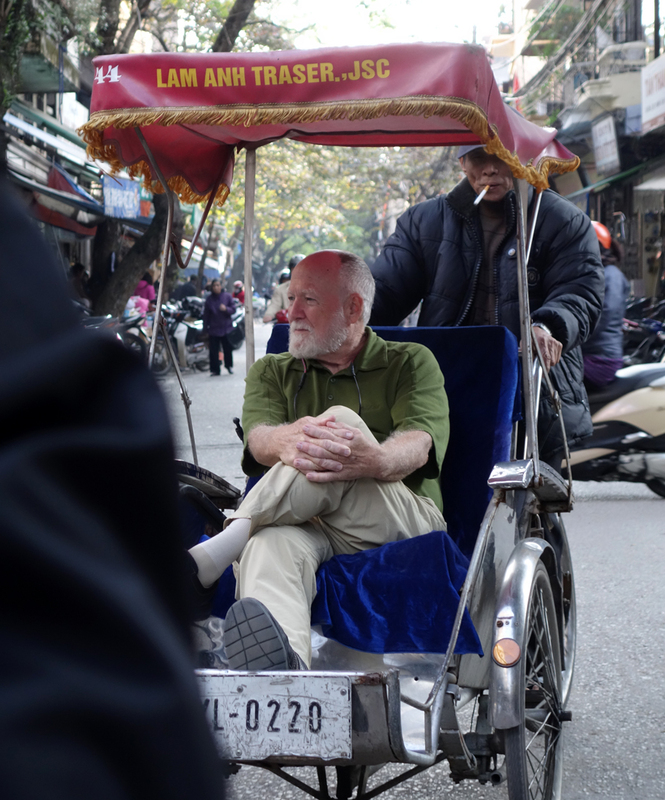 Up first was a cyclo ride through the old town just to get us acquainted with the streets and area. 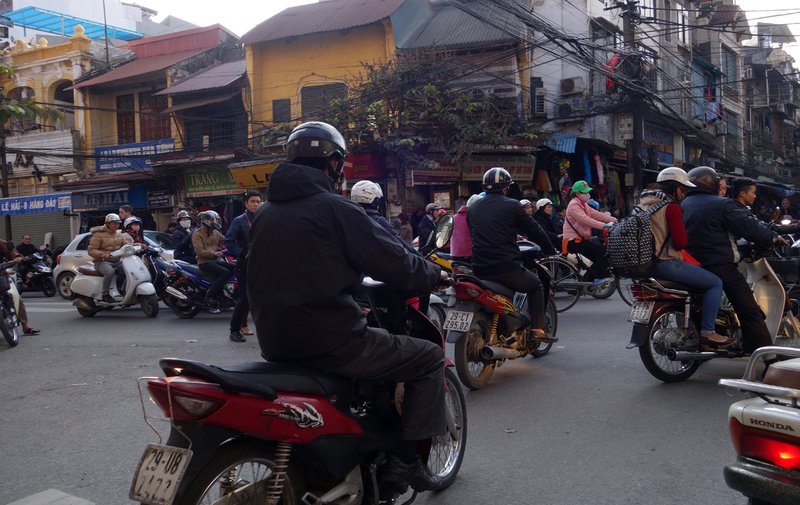 It was quite fascinating to be in the midst of traffic — motorcycles, cars, buses, bicycles, and cyclo, weaving in and out of traffic down these narrow roads. 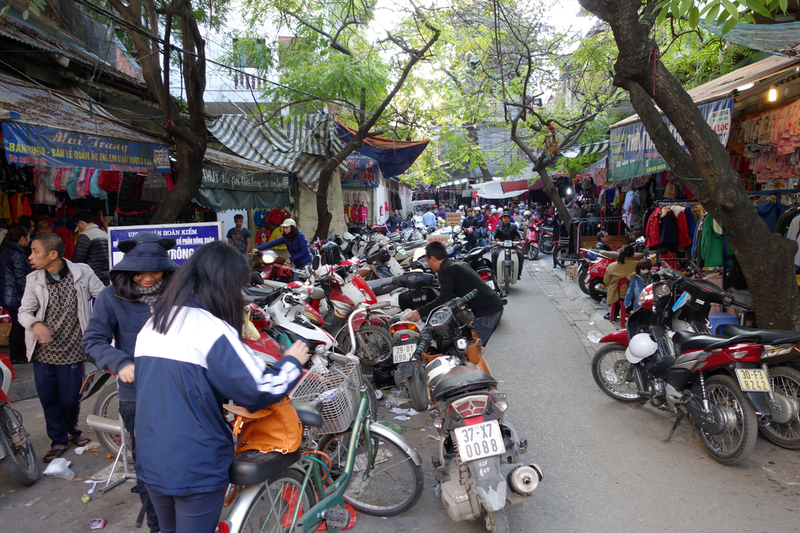 Traffic doesn’t seem as bad as it is in Saigon, but that is a relative term here. The streets are much more narrow so one doesn’t have to manage 8 lanes of traffic just to get across a street. Interestingly, each block seems to be rather loosely designated for similar kinds of small businesses: one block for all (knockoff) shoes, one for all Christmas decorations, one with just coffee shops, one all clothing, one all welding shops, etc. 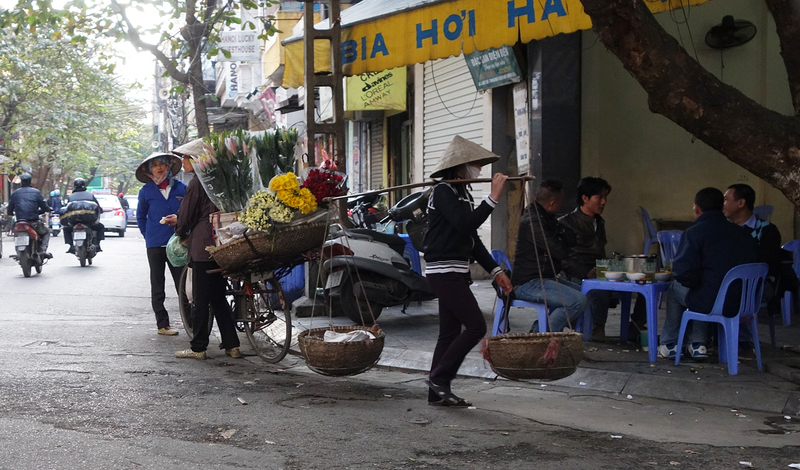 Enjoying the streets of old-town Hanoi. Great way to get up close and personal! 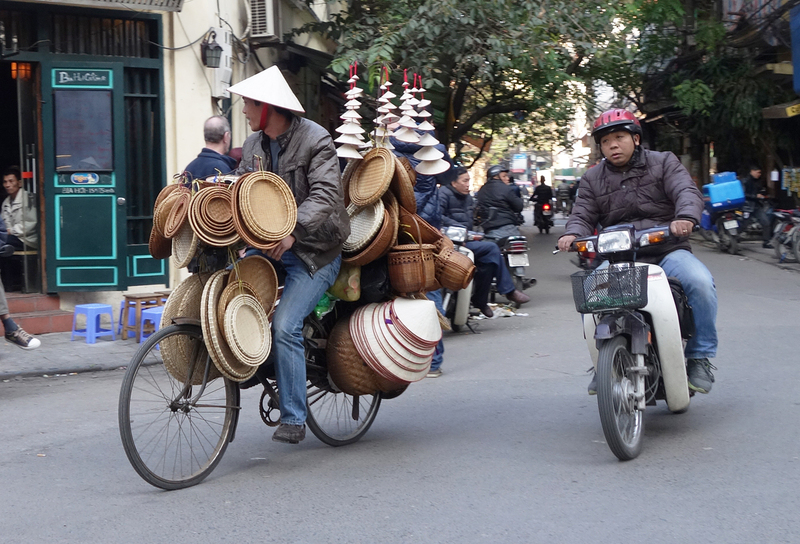 Always amazing what you can carry on a bicycle! A common sight. The little breads are fantastic. Did “I say narrow streets”? 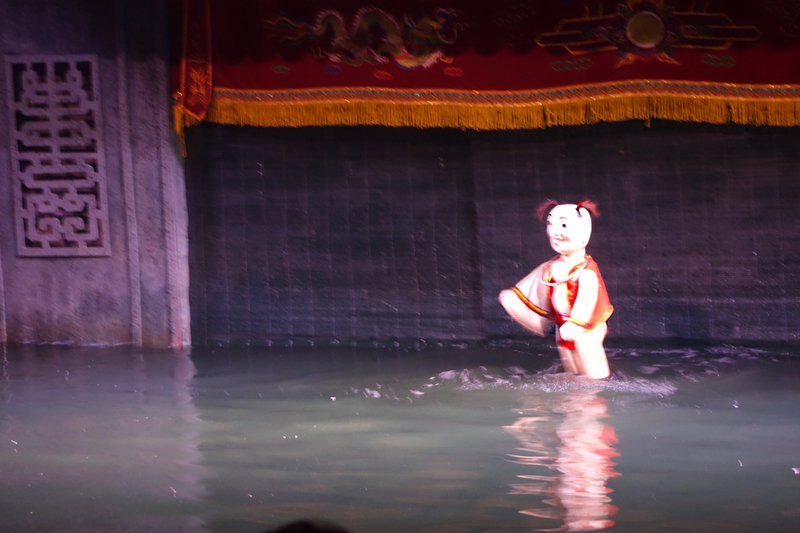 We attended a water puppet show our first evening in Hanoi. A delightful experience. Amazing what the puppeteers can do in a watery media; SO talented. What a fascinating background history: of rice farmers putting on stories for their children’s entertainment. 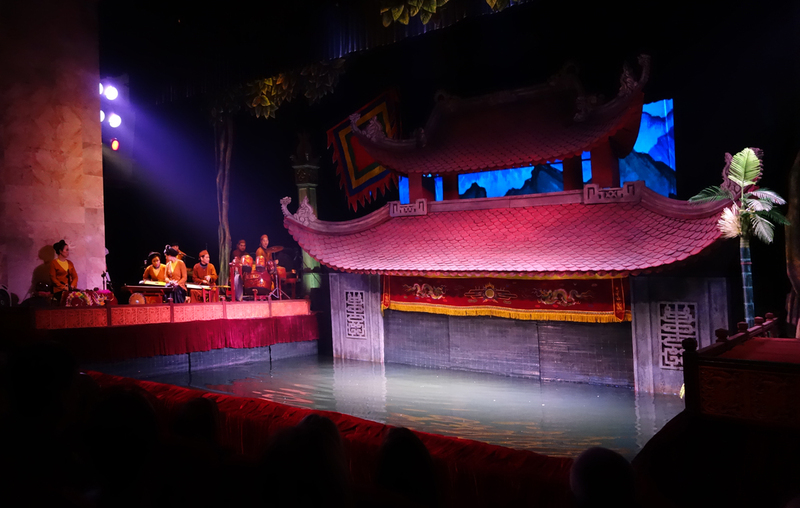 There were fire-breathing dragons, fishermen in boats, sword-play and even climbing palm trees – – – ALL done by puppeteers behind a screen and controlled from under the water. One of the cast of unique characters (so dark, I couldn’t capture any of the action sequences). The muscians and singers. 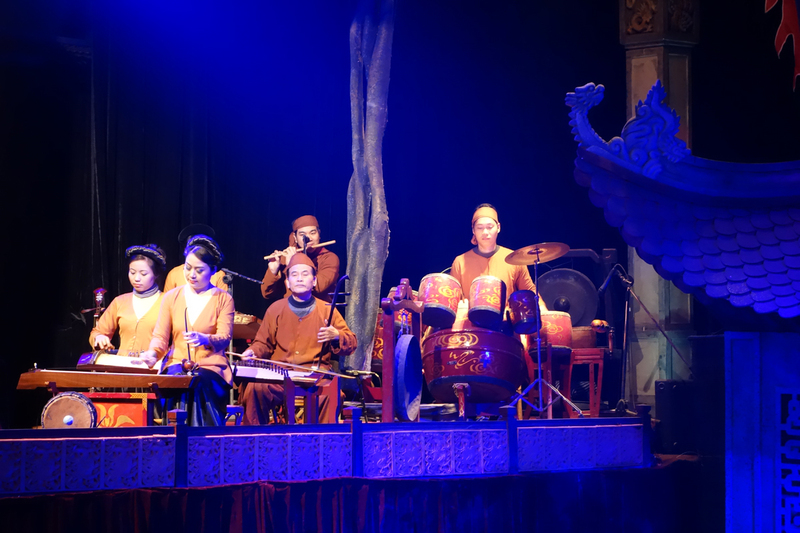 All done with traditional Vietnamese music and instruments. Another wonderful dinner, then back to the hotel to get ready for a very full day of touring this great city of Hanoi tomorrow. But our first day had been packed with new sights, sounds and experiences. Tomorrow offered even more. Balconey dining at its finest: watching the street-scene unfold below while we eat. 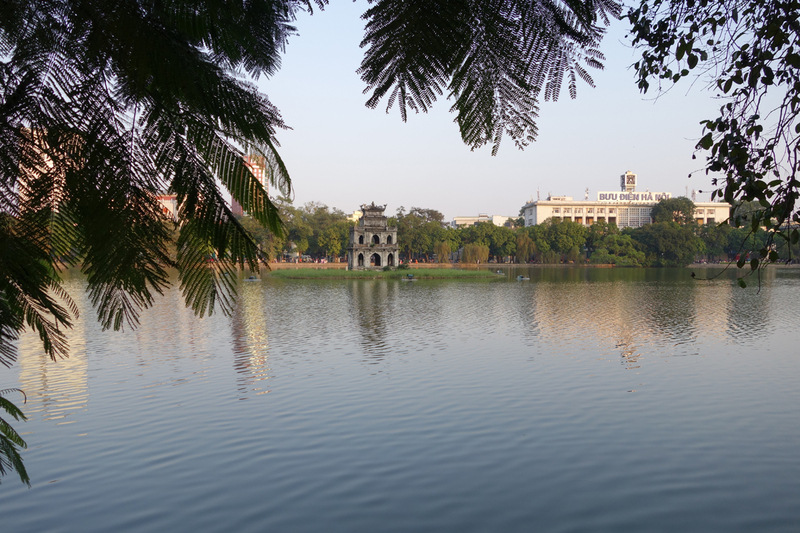 Hanoi, originally named Thang Long or “City of the Ascending Dragon”, was the first capital of Vietnam back in 1010 A.D. 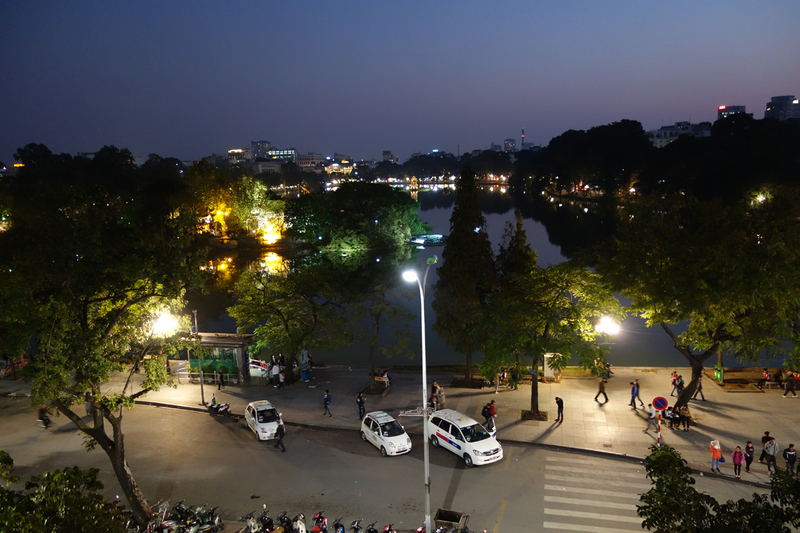 In 2008 Hanoi incorporated a lot of the surrounding area into its city limits, and now ranks in the top 20 largest cities in world. 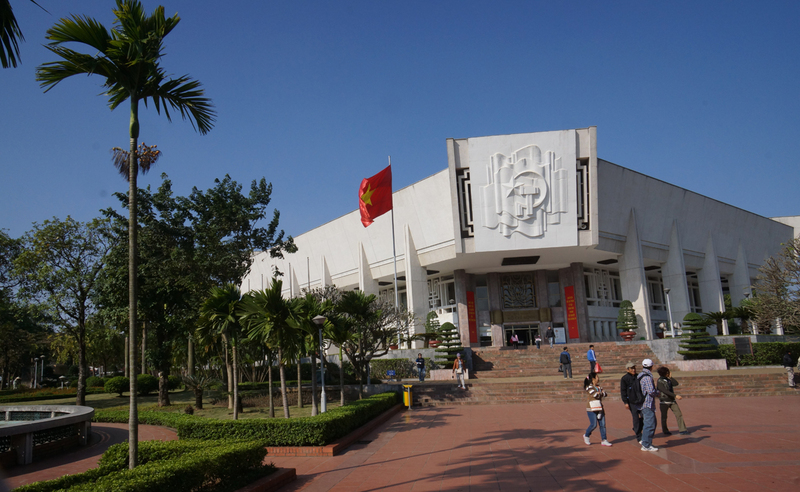 Our day started with a visit to the Ho Chi Minh Mausoleum and Museum. We viewed “Uncle Ho” laid out to rest in a very solemn procession. Almost thought we were going to have to march in step with the honor guards surrounding the complex. We viewed a ‘changing of the guards’ before entering the mausoleum. The leader straightened up the young guards uniforms and he must have been spoken harshly to the guard. He looked a little shaken up when we went past. 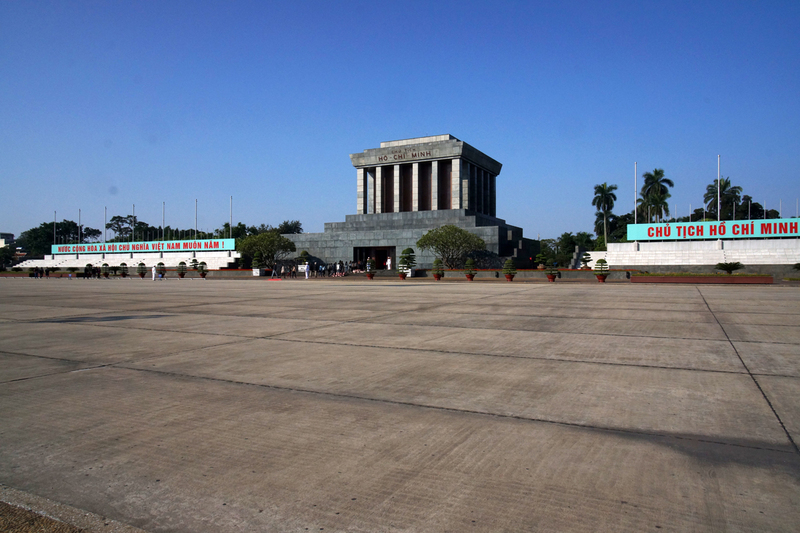 It is interesting to note that Ho Chi Minh expressed his strong desire to be cremated, but to the people here he is revered like a god, hence the government was going to ensure his remains would be on display “forever”… The grounds around the masoleum are magnificent. 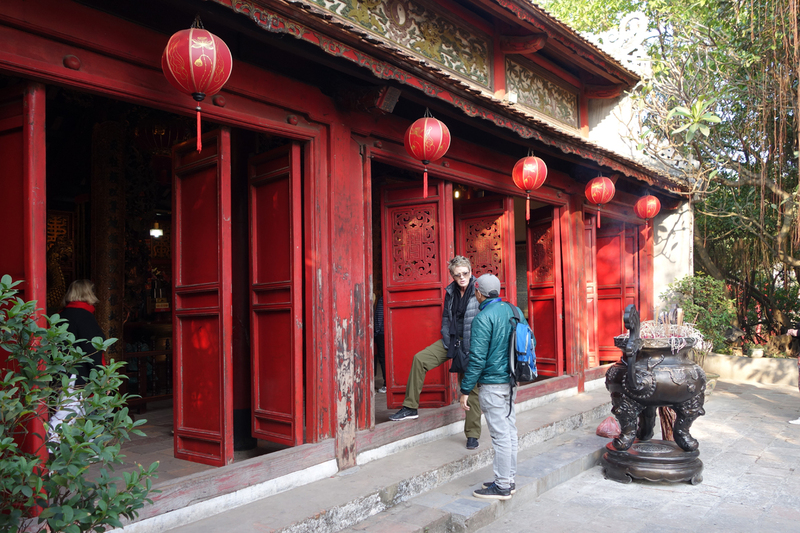 “Uncle Ho” declined to live in the palace that was built for him, and had a beautiful teak stilt-home built that was very modest, like the homes of the common people. Street of the old quarter of town. 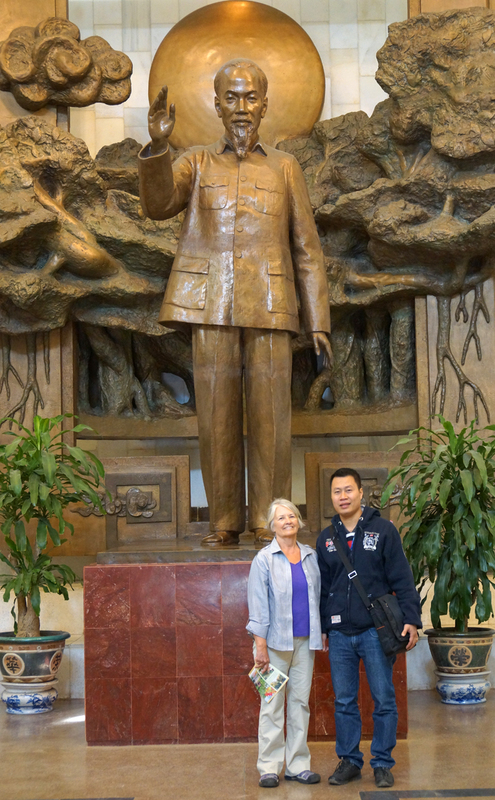 Our guide with Evie at “Uncle Ho” statue near the entrance to his museum. 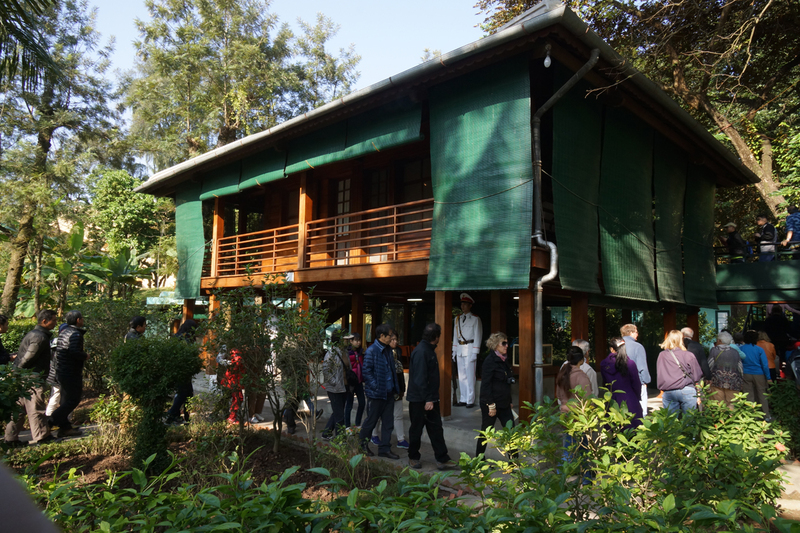 Uncle Ho’s modest home built in the traditional stilt style. 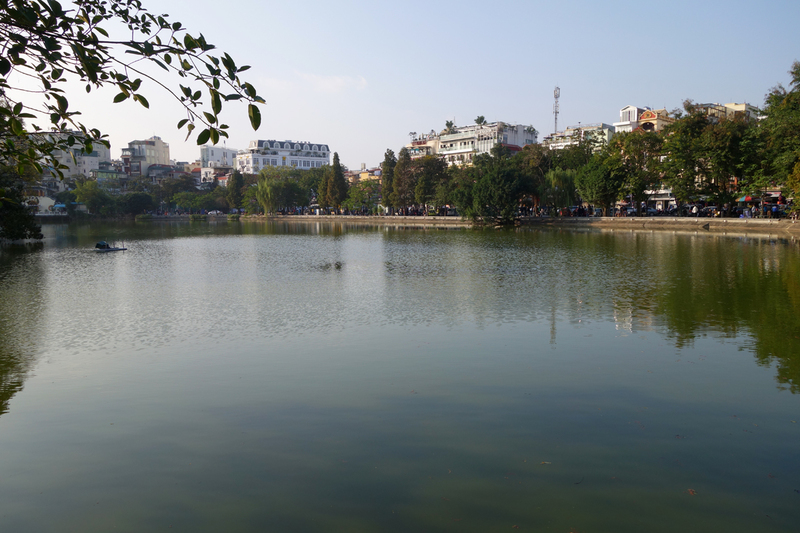 We walked around the small lake in the old town area, which was near our hotel. 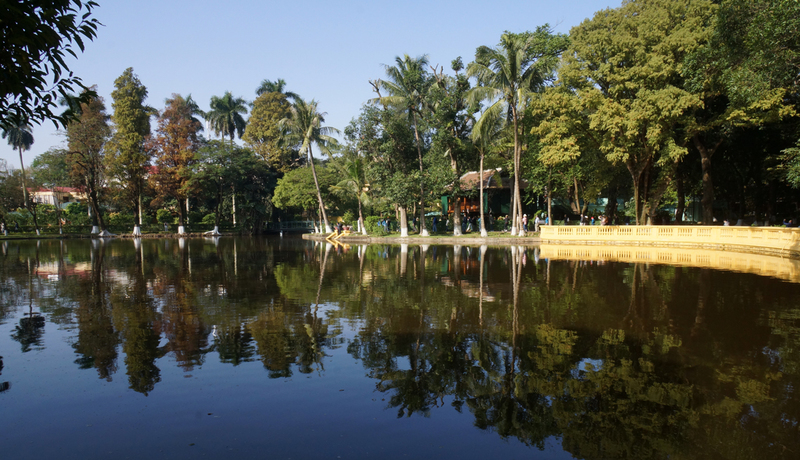 It is a busy place with people exercising, performing their morning Tai Chi, walking, or just visiting with friends. 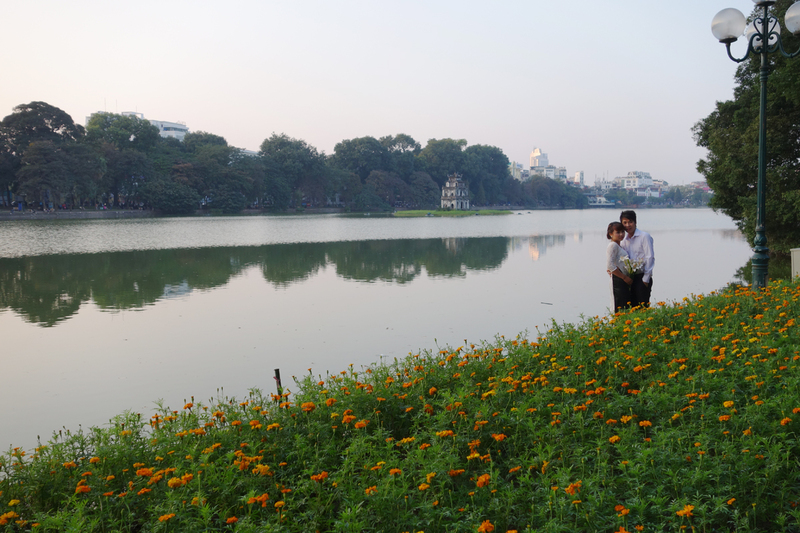 It is the season for weddings here, and we saw many couples getting their pre-wedding pictures taken all around the lake. We were also interviewed a number of times as we walked around, by both college and high school students wanting more information about the good old USofA for class projects. 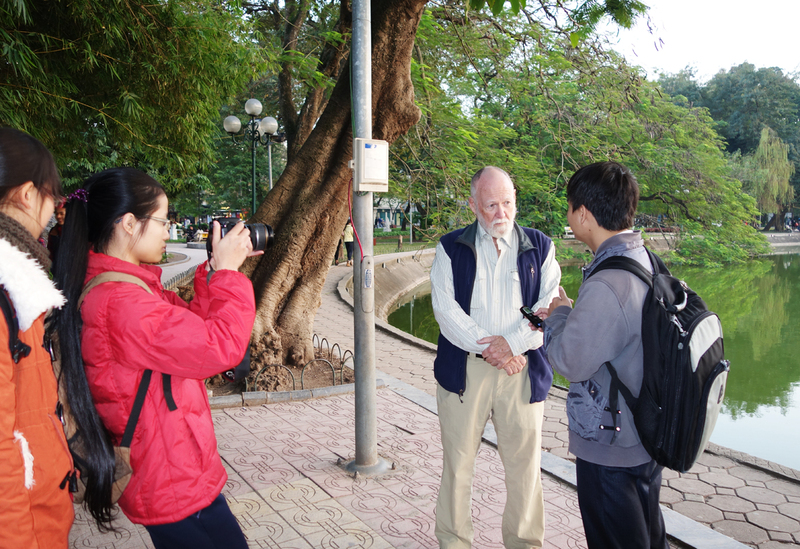 Similar questions to those interviews we had from high school students in Hoi An. They all are so eager to practice their English skills and soak up information like a dry sponge. Very enjoyable experiences. Perfect sunset for a newly-engaged young couple. 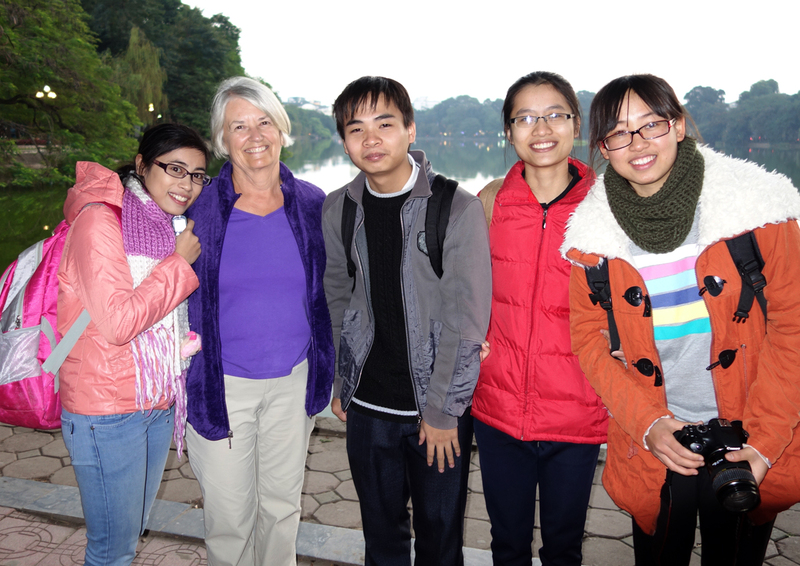 The four students finished with their assignment, and our new Vietnamese friends! Peaceful. A sheer delight in the midst of this old part of the city. More beautiful historic places. This shrine is in the middle of the lake, across a small causeway. Love the dragons! 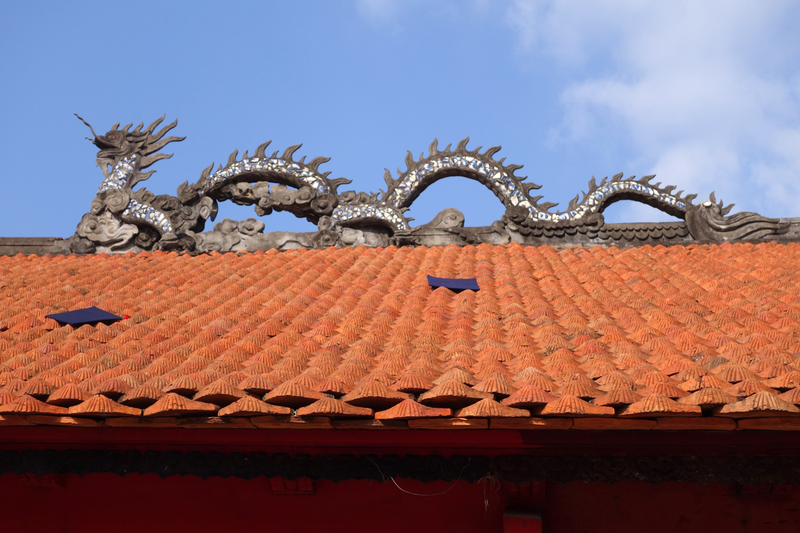 And look at the detailon these roof tiles. A popular game played — looks like a form of chess, but played with a sense of capturing territory. 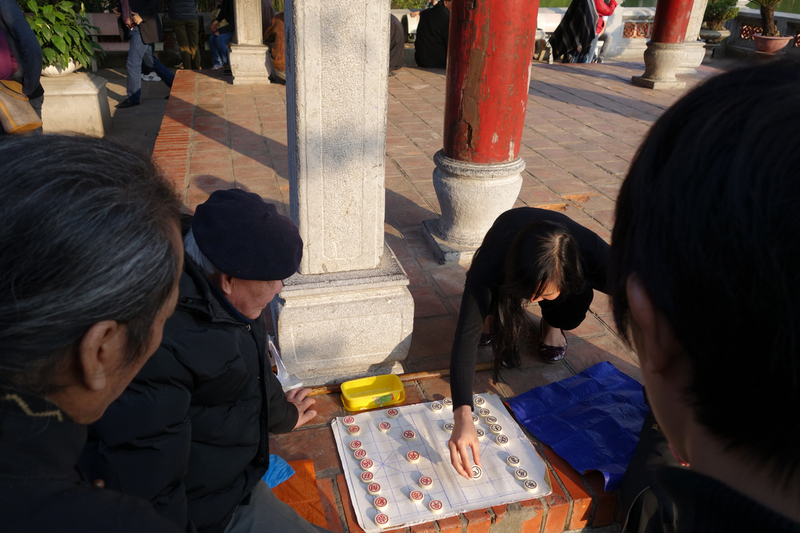 This young lady stopped her walk to have a game with a couple of elderly gentlemen near the shrine. Loved the light. 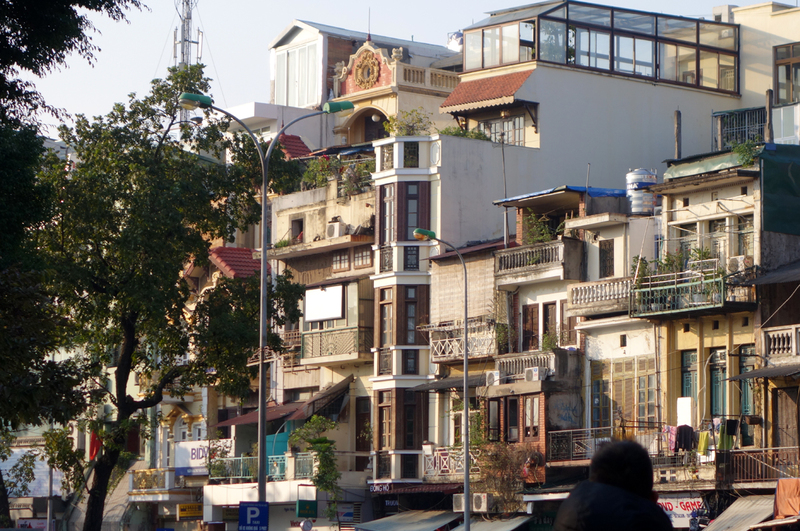 This is on the grounds of the Ho Chi Minh stilt home, which is in the middle of the image. 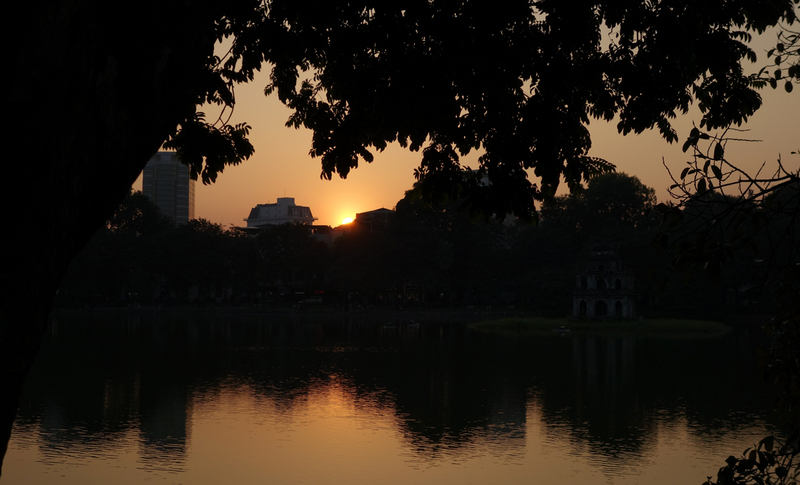 Hanoi – a fascinating city: great energy, history and delightful people.